New Favorite Bike Shop » Harrumph! Sing, Goddess. Sing the skill and glories of Quad Bikes. Saturday, I had a second wonderful experience with them, or specifically with David. I fully expect a third of three next week. Anyone who knows me understands how I love biking and how I can harrumph about typical bike-shop dealings. The people at Quad (on the Radcliffe quadrangle) have disarmed me. I have told drinking buddies and now expand my own song of praise. A tip of the toupee has to go to the Weekly Dig, which published one of their typical quarter-assed guides in May. This was the briefest of sketches for a wee selection of area bike shops, comparing tune-up prices. Quad stood out there with kind of a warning that went off for me — did their much cheaper price mean much lower quality? I had reason to find out a couple of months later. Regular readers know I have been recovering from serious leg surgery. I’m slower than before I got an ankle-to-knee titanium tibia nail, but I kept hoping some of my diminished speed was the condition of my road bike. So, I decided it was time to tune up the equipment as well as me and figured at $36, I wasn’t risking much. That’s about a third of what Wheelworks charges. So, the answer to the warning is no, siree. Quad is as good, much faster and really understanding of customer relations. To my normal repair-shop rants, they are notorious for not meeting their promised dates, making mistakes, delivering less than you pay for, charging a lot, and far too often being arrogant or sullen or both. In contrast, the non-profit gentlemen (no distaff staff in sight) are pleasant, even jolly, as well as highly competent. Perhaps being only in their 20s has so far inoculated them from the grumpiness of stereotypical bike-shop guys. I could go on about the tune-up I got for my road bike. Suffice it to say it was excellent work at the best price I have seen in the past 20 years. Moreover, it was one-day service and they accurately said when it would be done. Consider though my panic last week. Since my operation, almost daily biking has been essential, physically and emotionally, to my leg rehabilitation as well as fitness and weight control. When my chain snapped Wednesday as I headed up the 12- to 15-degree grade hill heading home, I was a bit concerned. Then when I replaced the chain with its many thousands of miles, I was very concerned as the new one seemed fine…all except for serious skipping and slipping under load up hills. There are many hills to and from the Y, in addition to the killer alp I face whenever I want to get to my new home. I had already arranged to bring by my over 20-year-old Schwinn Sierra (that brand’s original mountain bike, heavy and hard tail) for evaluation. So, I called to see whether they’d squeeze in a repair of my road bike as well, to find if I had goofed up the chain installation or the bike had worn components that limited me to flat land. This was a Saturday and a typical bike shop might have said, “Sure. Get in line. We’ll give you a mechanic’s time after Labor Day.” Quad said to bring it over. Holiday weekend or not, they kept to the 1 to 6:30 hours. They diagnosed and fixed my road bike within the hour of my arrival. They said my old, beaten-up mountain bike could be fixed enough to make it a useful commuter. In honesty, my baleful countenance may have aided in the road-bike repair. David’s a great enough guy and at least as enthusiastic as I about cycling. He responded when I moaned. Rather than simply feel gratitude that they’d fix it before the end of the day, I found that he offered to do the job immediately. His diagnosis, which he showed me proof for, was that my old chain had married to the rear cassette cogs as it stretched and they wore down. The new chain, which I had apparently put on well and the proper length was too healthy and accurate. It slid right off the worn cogs. That required a new cassette in the rear wheel. Not only did they have a compatible one in the store room, but he would do the job that day. I asked if I should disappear for a few hours (thinking that Cambridge Common, a bar with a great selection of taps and low prices was two blocks away). David looked at me and either to keep me sober or more likely to keep my cycling vital said he’d do it within 15 minutes or so. I can’t imagine that service and responsiveness from Belmont Wheelworks or Ferris Wheels or other bike shops I’ve used. At Quad, David did what he said. The bill was low — $40 and change for part and labor. I was road ready as well as placated. For the Schwinn, it was my first mountain bike. It had been down a lot of hills, back when I used the downhill beast to go up hills, over boulders and down the other side. I am emotionally attached. I have given other cycles to Bikes Not Bombs and put my Girvin with the frame crack in the trash. I’ve lugged this beaten-up buddy around. 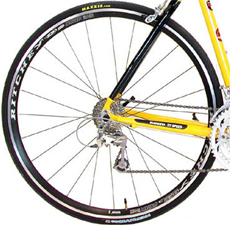 Its gears need serious adjustment and likely new cables for them and the brakes. The headset is a bit wobbly too. David said he can get it into shape for my fall and winter riding, conditions too perilous for a road bike with 23 or 25mm tires. In the snow, that would be like walking in socks on a huge porcelain plate. Quad, by the bye, has the rights to the many abandoned bikes on the Harvard and Cliffy campuses. Students and others lock and leave their losers rather than bother paying for help or fixing them. Quad takes those declared vagrant by the Harvard cops and repairs and sells, or if necessary, junks them. Their mechanics have lots of experience making the inert roll again. It seems my Schwinn is not as abused and neglected as many of those. If you need a second or an inexpensive mountain or road bike, Quad is likely to have several choices. Particularly in the late fall or winter and spring, they reclaim quite a few and tend to sell them in the $100 to $250 range after rehabilitation. That’s a bargain as well as environmentally sound. Having written for the management and business press for years before turning to tech writing, I see Quad as a big step above average customer service. Far too many companies, even little ones, seem to think customers are there for profit and convenience, not to serve and satisfy. In contrast, Quad staff grok customers’ needs. I have already told numerous people about the glories of these guys and shall continue to do so. Not only does Quad keep me on the road, its staff give a damn about doing so.